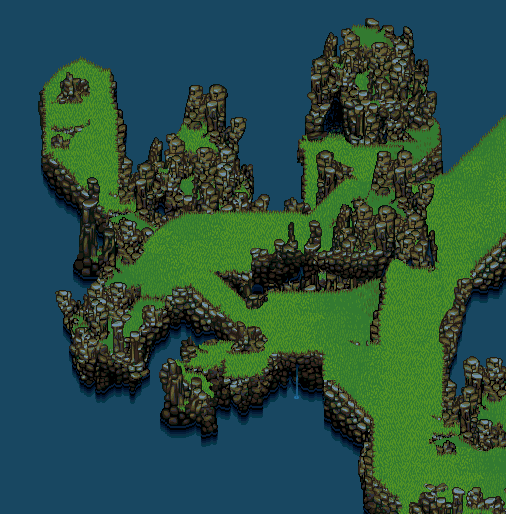 I just finished the landmasses for this scenario but I need to do some small caves and a waterfall to go with it. : I had to remove the eyeburning bright grass I had originally posted; it was getting to me. I think you should go and tweak your colors a bit. The green for that grass is really highly saturated, and it's straining the eye to look at. I changed your water too and chose a blue with more cyan, and then muted it down for a more rustic aged feel to it. However you could also use a blue that's brighter for a more sunny feel to it, and still have good results. I didn't edit the stones any, but they look really great in some places, and then in others their readability really suffers. In the first screen shot, some of the tiles of stone by the cave don't look as if they match up properly, and the little stacks of them get hard to read when they overlap each other. I think increasing the lightest value and putting more light on those stones will help them out a lot. I think you could also benefit with just a couple alternate grass tiles. It would really help break up the large area in screen shot four, if you has some alternates to play with. Thank you for taking the time and doing that. I will desaturate the grass as you did in your example, I like the water's color better in yours as well. I'll do another scan over the rocks on the big file to see if any weird tile over lapping/ misaligning occurs elsewhere as well. As for the grass.. I'll make some variation; thanks for suggesting that. I could attempt some dirty areas and some floral areas as well. Looks kinda like a moose. I think the transition on your grass was too sudden, 2 completely different types of grass clashing together, kind of not fitting together really. Thanks for posting Stava . Well I think it gives it more depth; which I really like! Pretty close to finishing but I'd like to work on a portrait before I do. I figured I would post meanwhile; for the sake of possibly improving it or making this the best it can be while keeping this project feasible (workload-wise). Oh goodness, now that I've looked at it again, I may have read what you were trying to do all wrong. I was seeing long wavy hair in a bun, but maybe you were going for a tight head of curls. In any case, you just might be overemphasizing each curl. They're too defined and orderly. None of your curls seem to overlap or layer either. See if you can find some reference of the kind of hair your making and leave some of it less defined. Might look more like hair and less like curly brains then? Are you limited by tiles, by chance? Here's some edits. You know what my specialty is. I based the likeness off of the Erde artwork I had helped you with, in the Dropbox of long ago. What do you think?